Five hardworking and enthusiastic youngsters have earnt employment with a local community regeneration charity. 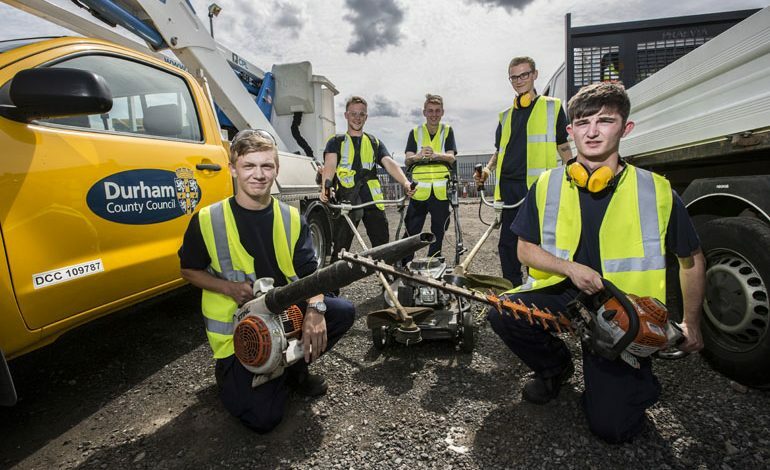 Dylan Constantine, 17, Robbie Harris, 20, Brandon Thompson, 20, Harry Atkins, 18 and Ben Taylor, 19, who were formerly not in education, employment or training have all secured jobs with Groundwork North East as part of its County Durham Environmental Task Force. This comes thanks to funding from Groundwork North East and Durham County Council. All five young people have been supported through the council’s programme DurhamWorks. The programme has come together with the council’s direct services team and the charity to offer the young people full-time paid work for 12 months. They will be employed by Groundwork and will receive vocational training throughout their employment. The young people are going to be working with the council and other partners in local parks, woodland and church yards. They will be cutting grass, hedges, repairing fences and tidying up walk ways. All five have all already received health and safety and machinery training with hedge cutters, strimmers and mowers delivered by the council. Oliver Sherratt, the council’s head of direct services, said: “It’s a pleasure to be able to bring these dedicated young people into the workplace, where we know they’ll be a real asset to both Groundwork and the county council. “The more that they put in to the work they do, the more they will get out of it, both individually and as a team. DurhamWorks seeks to help young people aged between 16 and 24 who are not in education, employment or training into work by providing them with the opportunity to learn new skills that will help them in their future careers.